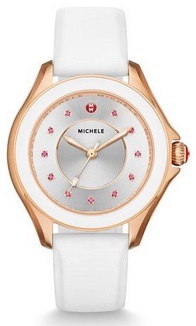 Home > Watch > MICHELE Cape White Silicone Strap Watch with Pink Topaz Dial Markers, Rose Golden Only $145 + Free Shipping! November 8, 2018 Comments Off on MICHELE Cape White Silicone Strap Watch with Pink Topaz Dial Markers, Rose Golden Only $145 + Free Shipping! Neiman Marcus Last Call has the MICHELE Cape White Silicone Strap Watch with Pink Topaz Dial Markers, Rose Golden marked down to only $145! Get free shipping on orders of $99 or more with coupon code: LCSHIP added to your cart. Amazon: Ring Video Doorbell 2 + Echo Dot (2nd Generation) Only $139.99 + Free Shipping!